Road Blockers offer a means to semi permanently close a road or passageway to prevent the access of vehicles. We are unique in that we can offer surface mounted road blockers which can be installed with minimal disruption, and at a fraction of the cost normally associated with such projects. Surface mounted to a flat solid surface, where in raised position it serves as a regular road blocker, and in the lowered position it acts as speed bump. Shallow mounted within just a 200mm deep recess where in raised position it serves as a regular road blocker, and in the lowered position it is a flat metal surface. Being certified according ASTM F2656/F2656-15, M30, P1(-0.67m) and IWA14-1, BlockerV/7200[N2B]/ 4890:0.25 standards, this surface mounted road blocker is provides a high anti-terror protection level. They are certified crash rated and can stop a 7 tonne vehicle travelling at 48 kph, and the images below are taken from that crash test which was carried out at CTS in Germany. 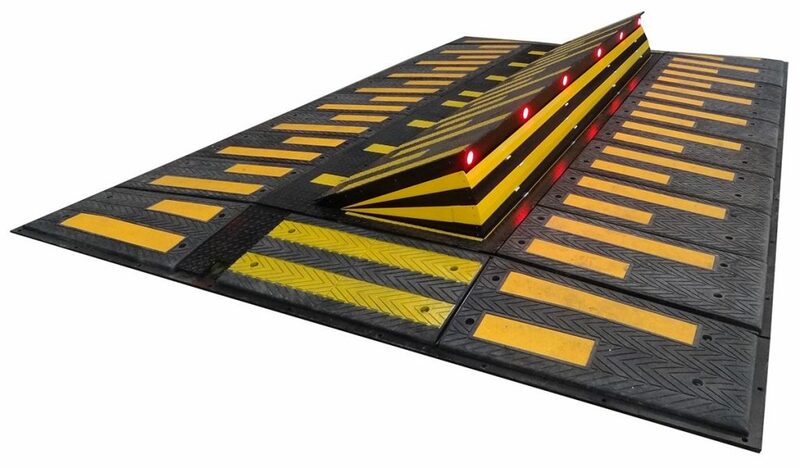 Our surface mounted road blocker can be deployed quickly to a flat road surface in a normally raised or normally lowered position, and can be remotely controlled from a central location to securely lock down any area. Although for a reliable operation they are required to be fitted to perfectly level and solid roadways, our surface mounted blockers effectively eliminate the normal difficulties and restrictions of installing devices in areas where there are likely to be a large number of service ducting.